After only a year in development Sonic the Hedgehog was released in 1991 as Sega's response to the Super Mario Bros. franchise. In this platform game you're tasked with taking down Dr. Robotnik who has stolen the six Chaos Emeralds. Unlike its sequels which had two acts per stage the original is made up of three acts; I prefer this approach as it helps to pull you into each theme rather than rushing you through it. Although the series is known for its speed Marble Zone and Spring Hill Zone are slower-paced and designed so that you have to be more methodical and do some basic puzzle solving. They're the complete opposite of Green Hill Zone and Star Light Zone where you race through loops and try to finish the level as quickly as possible. I enjoyed the contrast between these two gameplay styles and was surprised how fast the game still feels with barely any slowdown. 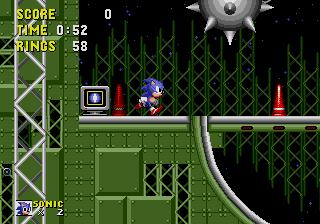 If you manage to get to the end of an act with at least 50 rings you'll gain access to the Special Stage where you have the chance to collect a Chaos Emerald. You continually move around a 360° rotating maze and it's fun trying to avoid the obstacles and locate the Emerald. The boss battles are varied including one where you have to travel underwater through a vertically scrolling level while trying to avoid hazards and keep up with Dr. Robotnik. There's tons of replay value in the game as each act has multiple routes to explore and there are two different endings depending on how many Chaos Emeralds you have. The graphics, level design, animation and SFX are top notch and everything feels polished to a sheen. The music is highly memorable and captures the atmosphere of each stage. While most game developers failed in their bid to create a rival mascot to Mario, Sonic Team succeeded on all levels. Sonic the Hedgehog is a landmark title and it's no surprise that it was instrumental to the popularity and commercial success of the Mega Drive. Random trivia: Before deciding on a hedgehog, Sonic Team tried out a number of other potential mascots. These included an armadillo, a rabbit, a kangaroo and a human character with Bart Simpson like hair!